Nine months have passed since the people who once lived in the underground city of Ember made their way to the surface. The refugees from Ember are now will settled in the town of Sparks but life is far from easy. Winter is approaching and food is scarce. The Emberites are not used to cold temperatures, to thunder and rain, and to the dangers of normal life. Sometimes a few of them even think of their life in Ember with nostalgia. One of these people is Lina. Surely her life was easier when she was living in Ember than it is now. One day a roamer comes to Sparks and Lina buys an old book from the woman for her friend Doon. Though most of the pages in the book are now missing, Doon quickly realizes that the book was left for the people of Ember to find. He is sure that the book contained instructions or directions of some kind so that the people of Ember would be equipped to deal with the world above ground when it was time for them to emerge. Doon cannot tell what the "Instructions for Use" are for because so little information remains in the book, but he is determined to find out. Doon thinks that the instructions describe how some kind of "machine" or device should be used, and he believes the machine - whatever it is - could very well make life in the town of Sparks a lot easier. There is only one thing that Doon can do – he has to go back to Ember to try to find more information about the book or the special device that was left for the Emberites to use. He askes Lina to go with him, and though she is afraid of what they will find and of the journey that they have to make, Lina agrees to go with her friend. 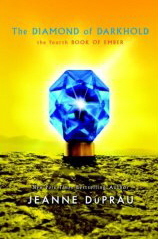 In this sequel to the People of Sparks Jeanne DuPrau takes her readers on a fascinating and exciting journey back underground to the city of Ember. All kinds of surprising events take place, and connections with the past that have been lost over the course of time are reestablished. Lina and Doon, who worked together to lead their people out of the city of Ember, have new challenges to face, and readers will be intrigued to see how these two young people face their fears and overcome the difficulties that they encounter.